Hon. Michael F. Mullen graduated from Fairfield University with an A.B. in English and St. John’s University School of Law. At St. John’s, he was a Thomas More Scholar and a member of the Law Review. He was admitted to the New York State Bar in 1963. In January 1987, he was appointed a Judge of the Court of Claims by Governor Mario M. Cuomo and for twenty years sat on the Suffolk County Supreme Court. The Judge is a frequent lecturer at the Suffolk Academy of Law, and was honored by the academy as a “Master Teacher.” He has lectured at the annual seminar for State Judges and to attorneys under the sponsorship of the State Bar Association and St. John’s Law School. 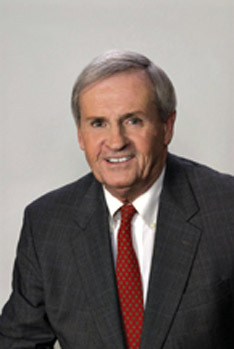 Judge Mullen served as Supervising Judge of the Superior Criminal Courts in Suffolk County from 1993 until 1999. He was reappointed to the Court of Claims by Governor George Pataki in 1996, and again in 2006. In his twenty years on the bench, the Judge presided over countless high-profile trials and regularly disposed of more than 400 criminal and civil cases each year. He was described by the New York Post as “a fair, no-nonsense, scholarly jurist who doesn’t like cases to drag on,” and, in 2000, he was asked by the State Board of Law Examiners to participate in a review of the standards used in grading the Bar Exam because of “the respect he enjoyed for fairness and objectivity.” He is available to the profession to preside over all types of Alternative Dispute Resolution matters. He also serves as a Special Referee in proceedings instituted by the Grievance Committee of the Tenth Judicial District and as a mediator in the Commercial Division of the Supreme Court Suffolk County.